← How to Run a Single Inspection in IDEA X? It is snowing outside our office but it is getting hotter and hotter inside. Guess why? That’s right, releases are getting nearer. RubyMine team did theirs yesterday. IntelliJ IDEA 10 is close enough too. Indeed, we’ve just published IntelliJ IDEA 10 Release Candidate! One major thing we pushed to this build is a significantly reworked Git log view (see screenshot below). There’s also a number of other Git-related changes plus many stabilizing fixes throughout the IDE. See the complete list in this build release notes. So, if you have some feedback for us, please speak now! We are listening as carefully as we push our changes now! Stay tuned for more releases from JetBrains and for IntelliJ IDEA 10 announcement soon! This entry was posted in News & Events and tagged Git, ideaX, VCS. Bookmark the permalink. Very nice, but what about adding some of those features to Mercurial support as well? Great! Did you make every link in the log clickable? And integration with git-svn would also be nice. will idea x does this do too if it becomes a golden master? Awesome work guys – looking forward to all the Flex fixes as well. it would be cool to have the “incoming changes” view being populated with remote log information. That’s the view I use most by far. After SVN update, we get an update report, now that we are switching to git I presume it has a similar one. But there was one thing that always bugged me with it: it grouped the files into created, updated, deleted. I would much rather see there per module per directory with colors if they are created (green), updated (blue) or deleted (gray), so I can much more easily look past the modules/dirs I don’t care that much about. We do plan to add a similar repository history view to Mercurial integration, but unfortunately there’s zero chance for it to be implemented in time for IDEA 10. 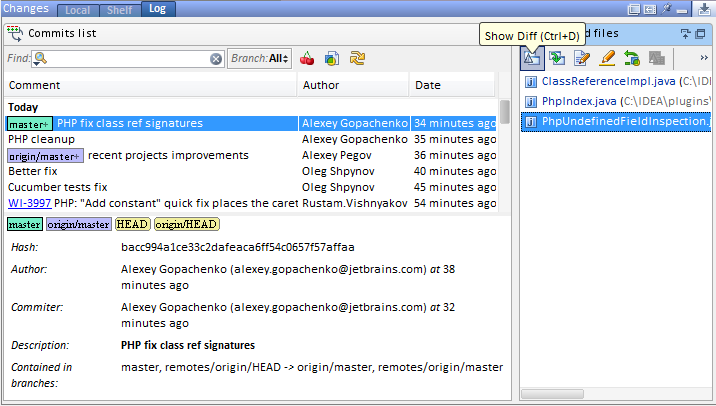 The git log view supports issue hyperlinks (Settings | Version Control | Issue Navigation). I don’t think it supports arbitrary HTTP links. Please file a feature request for that functionality. This log view is effectively a replacement for “incoming changes”. We don’t plan to implement “incoming changes” view as it exists with P4/SVN for Git or Mercurial. fsnotifier is already included in the Linux distribution of IntelliJ IDEA as of the RC build. please, please, please vertically align the YY MM DD HH MM parts – human is a visual beast! further, I only see 3 commits in Git log, which are taken from the last 5 (at random), and the rest are missing… hrm… or I don’t understand this window functionality yet? so glad to see IDEA 10 nearing release. please fix the menus under Ubuntu though, they look horrible!! Very nice Android support! Most efficient Java IDE I’ve ever used in the past 10 years. How do you disable anti-aliasing? Also, any tweaks you can do that would improve response and performance(ie code hinting etc) would make me a convert! How about parents of a commit? Or a tree view of the log? As it is, it is impossible to track merges to see what happened. Since a merge commit doesn’t contain the actual files changed, there is no way to track down what happened in a merge with this view. In practice, for me, this makes the log view basically useless for anything but extremely simplistic git workflows. If I’m missing something, somebody please help me out. I’d love to get rid of the other git tools I have to keep around just to keep up with the history. There are two IDE settings that seem to not work at all. I am using a MAC (Snow Leopard) and I have saved to a different layout Scheme name. I have reported this on youtrack for the last 6 releases. Please fix. 1. Editor – Colors & Fonts – HTML – Tag: I cannot turn off the background color or change the background color of the Tags. It always defaults to the gray. 2. Editor – General – Console Background: this does not accept any user changes. Dennis, just tested in IntelliJ IDEA 10RC2 and both cases works for me. Could you please check it again in RC2 and report these problems to http://youtrack.jetbrains.net ? I just tried it again in 98.486 and still cannot get those 2 features to work. I updated youtrack. When RC2 is released again I will try it. Ok I just tried again using version 98.520 (rc3) and those 2 features still do not work. I think the log got too much junk space: the “Commits list” label and table header don’t carry any function but take up space, so I have to either make the pane bigger or detach the Changes window and maximize it. Also I preferred the way svn log has a “more” link that shows more info about the commit, this bottom pane is less usable. Excellent. I have always enjoyed the subversion feature set which includes “Show history for selection” and also the Repository view and the Incoming Changes view. Is there no possibility for something like that to be implemented in the IDE for git as well? Unfortunately I’ve missed one important for me feature. Is it possible to view changes like it is done in CVS (Right click on module folder then CVS->Browse Changes. )?